A three-day party on three levels! The container event building BOOTH PLUS + was once again a highlight at the new festival site in Mendig. From the roof terrace, all had an optimal view of the entire festival grounds. The club area on the 1st floor has been remodeled and adapted to the look of the new Pall Mall brand “Extra Cut”. The Pall Mall Hostel is no place to sleep; instead it is a place for having fun, with space for more than 500 festival visitors. They can choose whether they chill in the Pall Mall Hostel Lounge on the ground floor,the generous outdoor area, or party in the Pall Mall Club on the second floor. 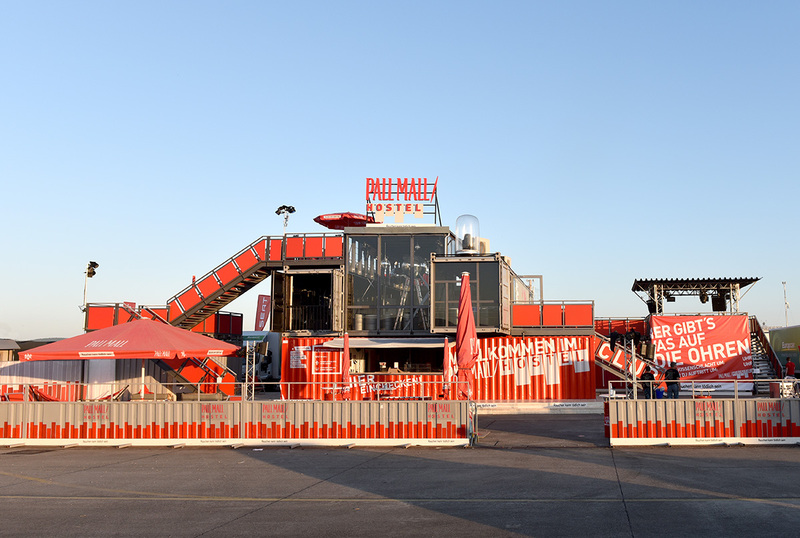 Furthermore, a stage on the terrace provides newcomer bands the ideal conditions to present themselves.The Pall Mall Hostel concept was born out of a collaboration with the Geometry Global and Fleck Promotion agencies, and offers a new dimension for Pall Mall’s promotional activities at various music festivals. Due to the fact that the container hostel was to travel to several events throughout Germany, the construction was developed in such a manner so as to obtain the certification from the TÜV (German: Technischer Überwachungs-Verein, English: Technical Inspection Association). To our knowledge it is the biggest container edifice, which has successfully fulfilled all the criteria of this extensive permit procedure. The ground floor is the reception where the guests can register online and receive promotional give-aways. The lounge with its Wi-Fi connection and double sided bar offers maximum comfort. In the annex you will find the backstage area, to where the bands can retreat, as well as the storage container necessary for the successful operating of the hostel. On the first floor is the “Pall Mall Club” with its own bar and professional sound and light system. The ample glass wall presents a delightful view over the festival ground. The motto here is: “to see and to be seen”. The stage is on the terrace and is built out of container decks. It is the centrepiece of the outdoor space and can be seen perfectly from all sides. 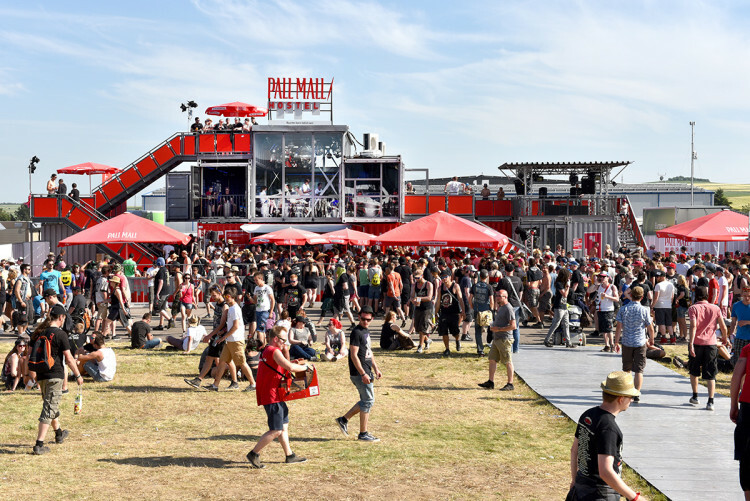 In the future there will be a further terrace on the second floor allowing for an extraordinary view over the whole festival grounds and the Pall Mall stage.